Malta Med is a joint venture of Albany Med and Saratoga Hospital. The two hospitals have joined together to meet the needs of one of the fastest growing areas in the Capital Region by providing top notch Urgent Care and Emergent Care in one convenient location. Malta Med treats urgent and emergency conditions. We treat issues that would send you to an urgent care center, while also providing the added comfort and security of doctors prepared to diagnose and treat more serious problems. We can monitor your condition on-site for up to 24 hours, if necessary, potentially avoiding an admission to a hospital. If you need inpatient care, you will be transferred to a local medical facility of your choice. 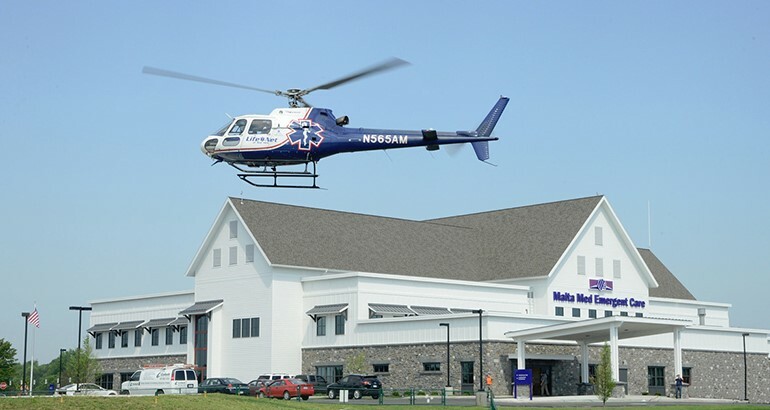 Malta Med is easy to reach, right off Exit 12 of the Northway, and we have plenty of convenient parking. If you believe that you or a loved one is experiencing a potentially life-threatening medical issue, you should call 911. But for nearly any other problem, come to Malta Med where our highly trained staff is waiting to assist you any time of the day or night, 365 days of the year. Our providers can quickly be in electronic, real-time consultation with specialists at Albany Med and Saratoga Hospital. Our board certified emergency physicians are available 24/7, for diagnosis and emergency medical procedures. We have a helipad and ambulance bay for the fast transport of those who need critical care. Malta Med Emergent Care Services is a joint venture of Albany Med and Saratoga Hospital. The two hospitals have joined together to meet the needs of one of the fastest growing areas in the Capital Region by providing top notch Urgent Care and Emergent Care in one convenient location. Malta Med treats urgent and emergency conditions. We treat issues that would send you to an urgent care center, while also providing the added comfort and security of doctors prepared to diagnose and treat more serious problems.